On December 19, electors will meet in their state and vote for President and Vice President as the Electoral College. This institution was inspired, in part, by the Catholic Church’s College of Cardinals. As most are now aware, the United States does not have a national popular vote for presidential elections. Instead, we’ve had multiple popular votes in the states, with Electoral College electors distributed by the size of the population in the state (which is reflected in its numbers of Congressional representatives. DC is treated as a state). The winning candidate must win a combination of states that gives them a majority of these Electoral College votes. In four elections, including 2016, the candidate winning more electors gained fewer total votes in the electorate than the candidate finishing second in the Electoral College. Is this because electors in the Electoral College are disproportionately allocated? This is part of it. 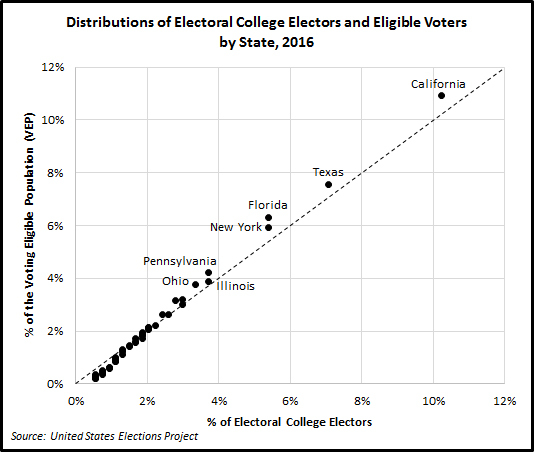 Larger states tend to have a larger share of the voting eligible population (VEP) than their share of electors (see the states above the line in the figure below. Data are from Michael McDonald’s United States Elections Project). No matter how small the state, the fewest electors assigned is still three. This creates slight over-representation in small states. The other more impactful distortion of the Electoral College is that in most states it is “winner take all.” The exceptions are Maine and Nebraska, who use some smaller districts to divide up their electors. Hillary Clinton needed 26% more votes than Trump to win each of her electors. She had 269,414 votes per elector compared to Trump’s 199,976 votes per elector. Clinton also had more “wasted” votes than Trump. 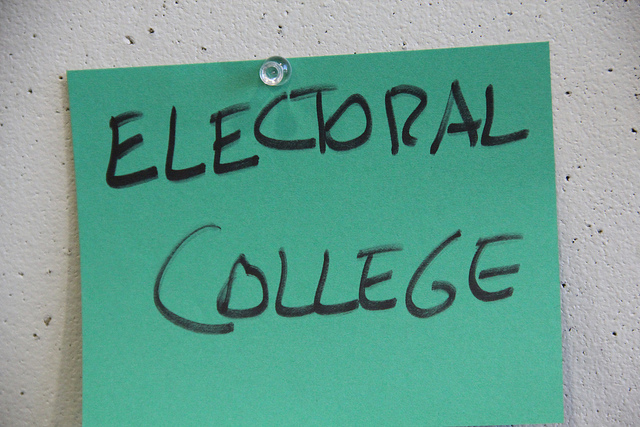 Because the winner in most states wins all the electors, there are many places where the votes for candidates did not result in any Electoral College gains. In all, 31.8 million people who voted for Clinton did not impact her standing in the Electoral College. This is a majority, 51%, of all her votes. By comparison, Trump’s wasted votes totaled only 20.7 million, 34% of the votes he won. An alternative allocation method for electors could use proportional representation to assign electors and achieve Electoral College results that are more reflective of the national vote totals. Recall the smallest states have three votes. To proportionally assign electors we would likely only be able to look at the votes won by the top two candidates (i.e., using a 10% vote threshold for third party candidates). Doing so with the 2016 vote, if we use the two-candidate share of votes for both Clinton and Trump and then apply these to the number of electors in each state we can give each candidate electors in rough proportion to their share of votes won. First we allow this to occur fractionally. For example, in Alabama, Trump led Clinton in the two-candidate vote 65% (1,306,925 million votes) to 35% (718,084 votes). Alabama has nine electors. Thus, Trump would get 5.8 electors and Clinton would net 3.2. Because fractional electors are not possible we simply round to the nearest whole person. Trump six and Clinton three. This also means in California, Trump would win 19 of 55 electors. Keep doing this for each state and you get Trump winning 268 electors and Clinton winning 270—a near tie but enough for a Clinton win. But of course these are not the rules of the game that have been established and used in the United States. As we noted in a previous post, winning the Catholic vote has long been a good indicator that a candidate will win the election. Then perhaps the Catholic population is closely aligned with the Electoral College? Not really. As you can see below, large Catholic populations are in California, Texas, and New York. 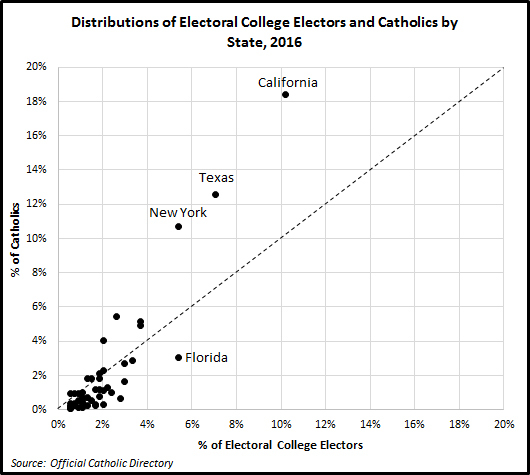 As a share of all Catholics these populations are much larger than the share of electors each of these states has. On the other hand, Catholics in Florida potentially are more influential than their population size if they vote in one direction or another in large numbers. According to physicist Stephen Hawking (a notable member of the Catholic Church’s Pontifical Academy of Sciences), we have to figure out how to leave this planet because in the next 1,000 or so years a mass extinction event (man-made or natural) will likely end human life. What happens when you ask people about the end of the world? 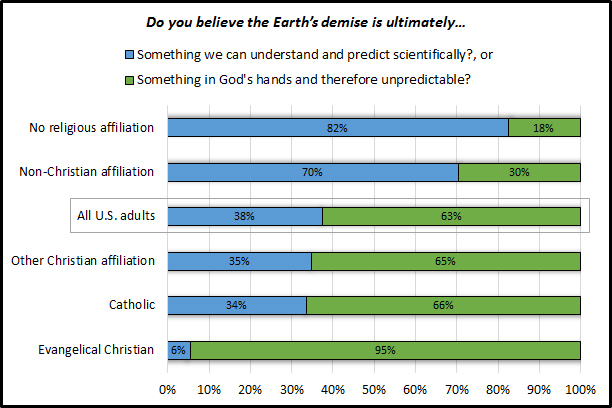 CARA recently asked a national random sample of adults, “Do you believe the Earth’s demise is ultimately something we can understand and predict scientifically or something in God’s hands and therefore unpredictable?” More than six in ten believe it is in God’s hands. However, when you break that down by religious affiliation there is a big divide in opinion between Christians and those of other religious affiliations or no affiliation at all. Only 6% of Evangelical Christians believe the Earth’s demise is something we can understand and predict scientifically. By comparison 34% of Catholics agree with this statement. At the other end of the spectrum, 82% of those without a religious affiliation (i.e., Nones) agree with the statement. Hearing this reality, opinion is divided with 28% of adults saying human destiny is here on Earth and 27% saying this is to be found elsewhere in space. Most, 45% say they don’t know. Once again the opinion of Christians differ from others. Forty-one percent of Evangelicals believe the destiny of human life is on Earth compared to only 15% of those without a religious affiliation. 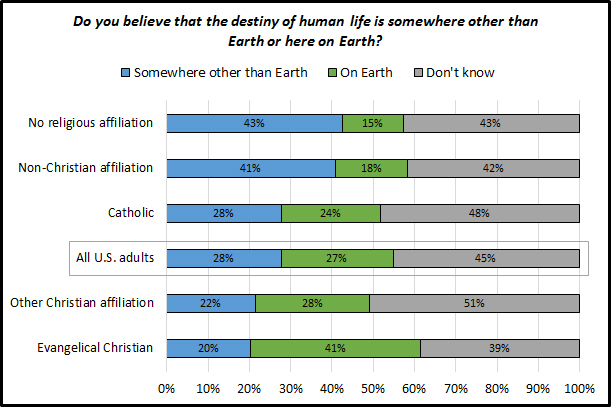 Twenty-eight percent of Catholics say the destiny of human life is on Earth and 24% say it lies somewhere other than Earth (48% say they don’t know). If Earth is doomed and human life can find a way to outlast it, then space is the place for the future. 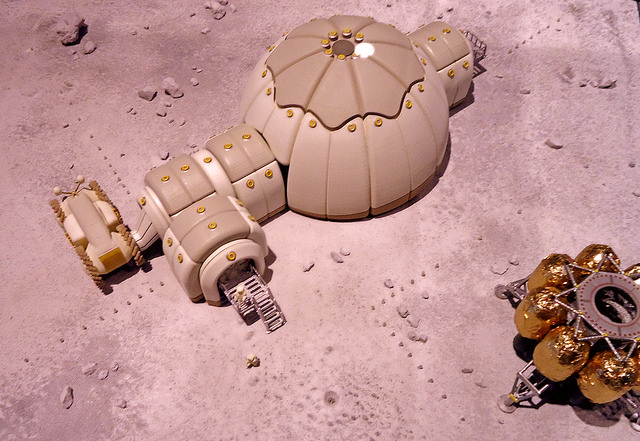 Seven in ten adults believe human exploration of space will be important (“very” or “somewhat”) in the future. Only one in ten say it is “not at all important.” Yet again, there are religious divides. 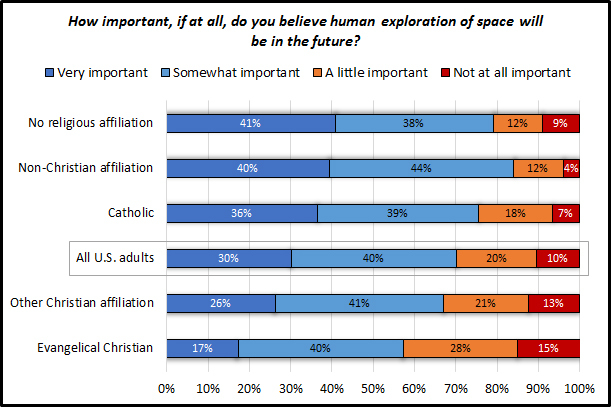 Seventeen percent of Evangelicals believe space exploration to be “very” important compared to 41% of those without a religious affiliation. Thirty-six percent of Catholics believe it will be “very” important. One might wonder why it matters if your religious affiliation is related to your views about the distant future, the ultimate demise of Earth, and space exploration. James Poulos, writing in Foreign Policy has argued, that Elon Musk, who has pledged to get humans to Mars soon, isn’t religious enough to colonize the red planet. CARA partnered with GfK Custom Research (formerly Knowledge Networks) to conduct the survey. Interviews were conducted with 1,927 respondents between May 16 and May 26, 2016. The primary sample includes 1,010 self-identified Catholics (margin of error of ±3.1 percentage points). Additionally, 917 non-Catholics were interviewed. Of the non-Catholics, 311 are Evangelical Christians (margin of error of ±5.6 percentage points). Another 357 have some other Christian affiliation (margin of error of ±5.2 percentage points). A total of 76 had some other non-Christian affiliation (margin of error of ±11.2 percentage points) and 167 had no religious affiliation (margin of error of ±7.6 percentage points). Six respondents declined to state a religious affiliation. Statistical weights, created by GfK, are used to approximate the results for the U.S. adult population.